Hmmm…..due to illness, or “illness”…..it is Whitney Houston we’re talking about after all. It looks like Houston suffered a respiratory infection so she needed to postpone her first show, the Associated Press reported. “[Houston] deeply regrets having been forced to postpone the show,” one statement said. Her tour will continue in Manchester, England, later this week. 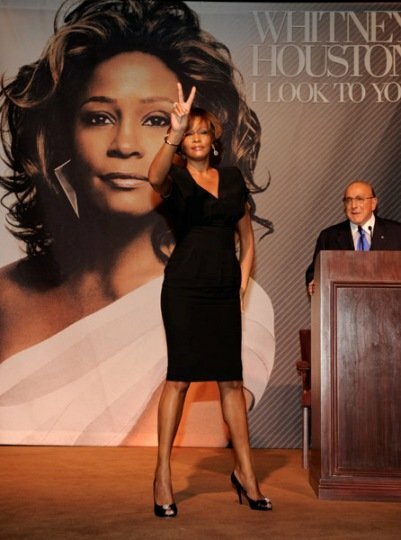 But sources say Whitney Houston would like to come back in Paris to perform before the end of her tour. The tour comes after the singer released her first album in seven years. ‘I Look To You’ album was released in 2009, featuring collaborations with Alicia Keys and R Kelly. She’s got a respiratory infection, huh? Aren’t those fairly common with crack smokers? Just asking. Plus, I read this blind item the other day – before Whitney canceled her Paris concert – and I immediately thought it was Whitney. If the blind item is talking about Whitney Houston, this latest “illness” makes a whole lot more sense. This former A list singer. Oh, wait. Well, I guess she is still A list. Yeah, still A list, but more on reputation. Anyway, this singer was at a concert this week. Not actually performing, but just in the audience. Right there in the audience she pulled out a crack pipe and lit it up. No worries at all. Yes, it was dark and other people were smoking other things, but to actually pull out a crack pipe? Problems. She did look like she was enjoying he [sic] concert though. 50 queries in 1.240 seconds.